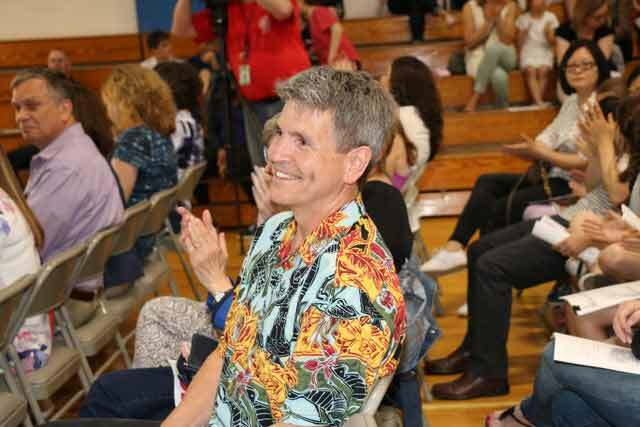 NORTHBROOK More than 700 Northbrook/Glenview School District 30 staff members, students, alumnus and families celebrated Wescott School music teacher Bill Vaananen’s last musical performance with “An Encore with Mr. V” at Maple School on May 24. He will retire on June 5, after devoting 37 years to Westcott students. Wescott Principal Dr. Chris Brown and Superintendent Dr. Brian Wegley welcomed everyone to the celebration. 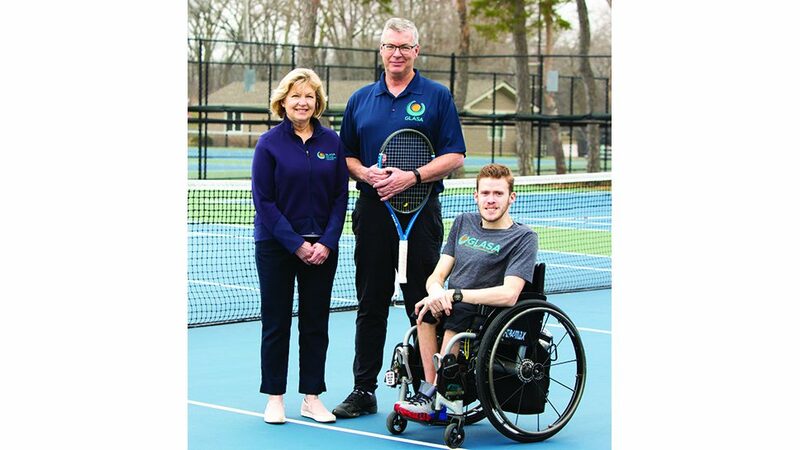 Board member Nancy Artz and Vice President Ursula Sedlak presented him with a formal proclamation from Village of Northbrook President Sandy Frum. 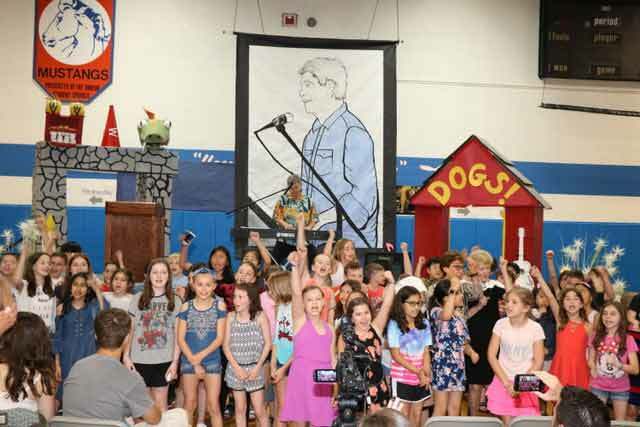 Throughout the night, there were celebrations of his 70 musicals and over 400 songs that were performed at Wescott School. Current students who addressed the audience were Cailyn Kelsen and Daniel Fliman. Alumnus Bill Prokopow sang Beatle John Lennon’s ballad “Imagine” to him; which was followed by Josh and Adam Carl and other alums, who spoke of Mr. V’s amazing influence and called him a “hidden treasure” in Northbrook. 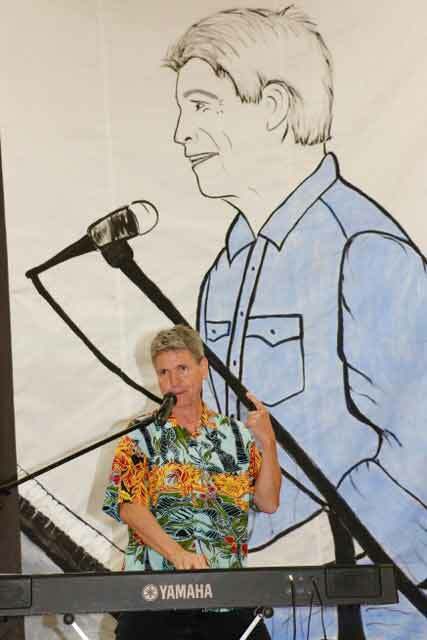 Wescott School music teacher Bill Vaananen at his retirement celebration. However, he’s never been completely hidden. He wrote “A Village by the Stream” in 2001 to commemorate Northbrook’s centennial, which is showcased in a bronze statue in Village Green Park! He has received so many awards, honors and certifications throughout his career, for example the esteemed Golden Apple Award for Excellence in Teaching, the Human Rights Award, and the National Star of Teaching Award. Former Principals Dr. Judy Frank-Gonwa and Dr. Terri Carman were in attendance and reminisced with the audience. Former Superintendent Dr. Harry Rossi was traveling, but sent a farewell video! At the evening’s conclusion, everyone joined in singing many of Mr. V favorites, “One Big Family,” “Just Read A Book”, “The Science Mash”, “Dogs”, “Joe Creek”, “Just Plain Folk,” and so many more! This was followed by a surprise appearance of the famous “Wescott Sausage mascots” and Elvis Presley, aka alumnus Andrew Braverman, who played “The King” in one of Mr. V’s musicals back in the 90s! After retiring, Mr. V has said that he would like to be an artist-in-residence at schools, and publish his songs so that his shows and songs may find a life in other schools nationally and possibly worldwide! The beat will go on, and the wonderful memories living inside the heads of over 15,000 present and former students will remain. Like the conclusion of the Wescott theme song, “One Big Family,” it is quite probable that Mr. V will “keep on rolling and never stop…at Wescott everyone is family.” That is forever. Happy trails Mr. V! Encore with Mr. V Committee members who coordinated this event: Principal Dr. Chris Brown, Patrice Bazianos, Roy Grober, Debbie Grundy, Shae Kelsen, Joan Marsh, Beth Preis, Gail Rago, Tia Stevens, and Sara Weinstein. The program design was created by Stephen Marsh and the video design was done by Steve Grundy and Roy Grober.